How China's musical.ly cracked the code for success in the U.S.
How a Chinese social media app made it big in the U.S.
Move over Snapchat, there's another app where teenagers are flocking to post their selfie videos. With more than 100 million users worldwide, musical.ly is the first social media app out of China that's hit the jackpot in the United States. It's filled with teenage girls and 20-somethings making funny faces into their smartphone cameras as they lip sync and mime the lyrics of hit songs. The formula clearly works. Musical.ly has attracted celebrities like Ariana Grande, partnered with the NFL and turned several American teenagers into online stars. Its success as a Chinese app in the U.S. is "frankly unique," said Danielle Levitas, head of research at analytics firm App Annie. The app's 37-year-old co-founder Alex Zhu says inspiration struck when he was sitting next to a group of teens on a train in California, where he was working at the time. "Half of them were listening to music with earbuds, and the other half were constantly taking pictures or videos and making fun of each other," he told CNNMoney. "They love music, videos and social media ... why don't we combine these three things into one product?" Related: Is Snapchat losing its cool? He and his team in Shanghai launched the app in English and Chinese. Once the downloads in the U.S. started to take off, they decided to focus solely on that market. It's now where most of the app's users are based. Zhu describes American teenagers as "the golden market" for new social media platforms. "They have time and creativity, and they share things all the time on social media, in school, and on the school bus," he said. Chinese teenagers, on the other hand, "are busy studying in school," he said, referencing China's high-pressure education system. Related: Vine's dead. Is Twitter next? The most popular "muser" -- as musical.ly users are known -- is 15-year-old Ariel Martin from Florida. She was one of the app's early adopters and now has more than 14 million followers. Under the name "BabyAriel," Martin is credited with creating the signature look of musical.ly videos -- miming lyrics with hand gestures, using exaggerated facial expressions and moving the camera to create new angles. "I was like, what if we like actually made it entertaining and made it fun to watch?" she told CNNMoney. Martin's musical.ly fame has helped her build massive followings on YouTube and Instagram. She sells her own branded merchandise -- including lipstick and phone grips with images of her blowing a kiss -- and tours the U.S. meeting fans. "I'm online schooled now because I'm traveling so much," she said. Martin and other celebrity musers help keep the app's regular users glued to their phones. 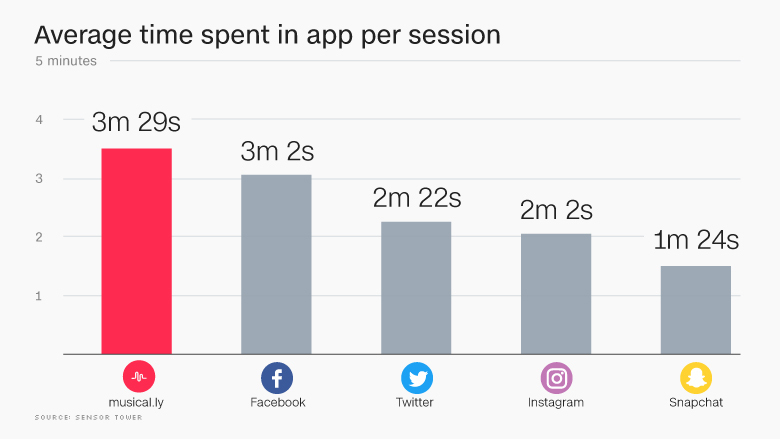 On average, people spend about 3½ minutes in musical.ly every time they open the app, a lot longer than the 2 minutes they spend in Instagram and 1½ in Snapchat, according to app analytics firm Sensor Tower. But musical.ly still lags the competition in sheer numbers of active users. It has about 20 million monthly active users in the U.S., compared with more than 60 million for Snapchat and close to 90 million for Instagram, according to data from Survey Monkey. Musical.ly is also constantly adding new features to try to keep users hooked -- letting them post videos that are longer than the original 15-second limit, adding stickers and promoting live broadcasts on sister app live.ly. The company chats every day with hundreds of its users on Chinese messaging app WeChat to get feedback on planned changes. The next step, analysts say, is figuring out how to make money. "They started introducing in-app purchases this summer. It's still too early to tell how successful it is, but they went from making no money, to pretty significant numbers in the last few months," said Wes McCabe, a marketing expert at Sensor Tower. Musical.ly and live.ly are also in a good position to lure advertising from the music industry, he said. Celebrity musers can now make money by receiving virtual gifts from fans, a concept that is well known in China, which has a huge live-streaming community. Musical.ly is also looking to expand internationally. It has strong followings in the U.K. and Germany, and Zhu said the company still has high hopes for China. But Chinese social media platforms need to secure celebrity endorsements and professionally produced content in order to attract users, according to Zhu. "Once we have bandwidth, we can find a good way to enter," he said. In the meantime, China's big social media success in the West remains largely unknown at home.